A few days ago, Jeanette and I stopped in Allentown, Pennsylvania for a slide lecture that I gave at the art museum there. We also visited the exhibition of National Geographic artwork. I blogged more about the show in a previous post. In 1988, in honor of its centennial, National Geographic asked me to create a painting to express the magazine’s legacy of adventure and discovery. 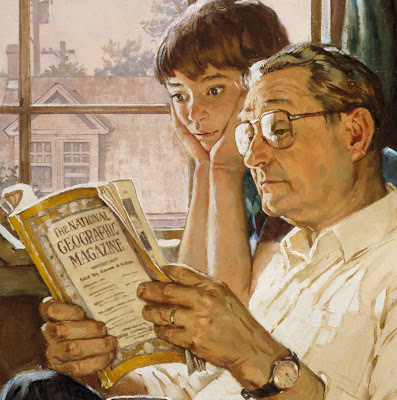 Instead of portraying some bold explorer, I thought it would be fun to show something more poignant and homespun—an old man looking back on his life and his world through the pages of old magazines. 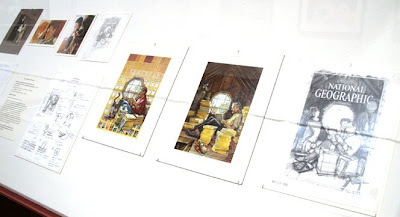 In the exhibit, my painting hangs alongside the preliminary sketches, letters, and photos that went into its creation. The painting shows an old man and his grandson in an attic, surrounded by the mementos of the man’s life: a military uniform, an old family photo, and a ship clock. I searched out all those items from real attics in my hometown and asked two friends to pose. In early concepts for the painting, the man sat all by himself. The idea didn’t quite work. It was depressing because the man looked lonely, despite the cat rubbing against his leg. Here’s a small early charcoal study. 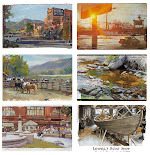 I did several of these, and a few small color sketches in oil. I also drew a full-size charcoal comp, which appears alongside the finished painting. Of course comparisons to Norman Rockwell are inevitable with a subject like this. 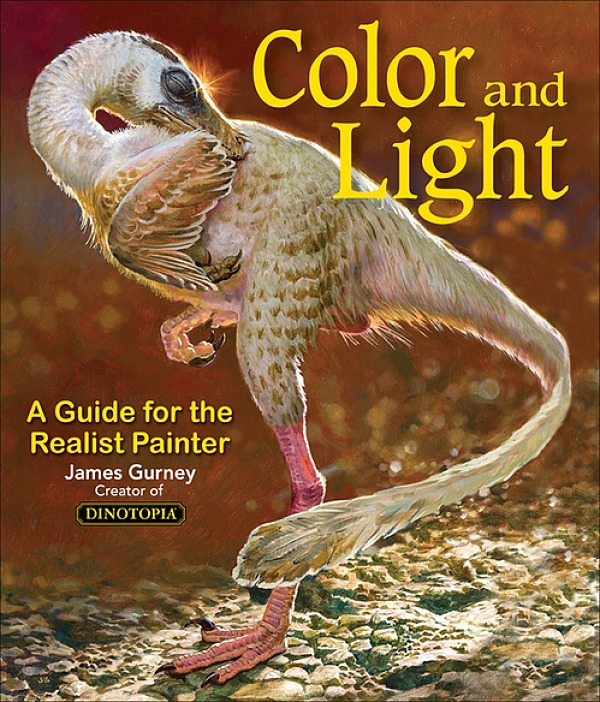 His work comes to mind whenever you paint American characters in a narrative setting. 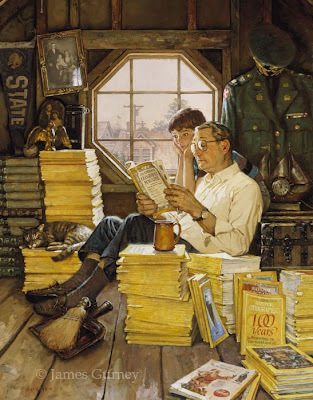 I love Rockwell’s work, but I wanted to make a picture that was authentic and not derivative, so I closed all my books on him while I was working on this piece and tried to find my answers in real life. The finished painting is in oil, 24x36 inches. This detail shows the cool light from the window and the warm illumination bouncing back from the attic space. I tried to capture the boy’s faraway expression, as if the magazine and his grandfather’s memories were taking him to another world. 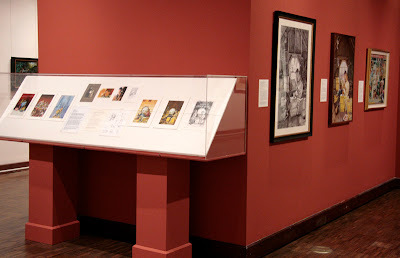 Installation photos courtesy Allentown Art Museum. 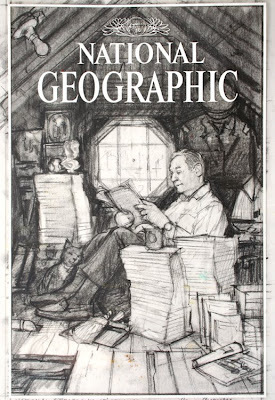 For any museum interested in booking "National Geographic: The Art of Exploration," contact Mary Dawson at the Norman Rockwell Museum at mdawson@nrm.org. I totally love the boy's expression! It took me back to my own childhood for a bit! All my grandparents are gone now, but I was lucky to have moments like this one with all of them. That boys expression is spot-on ! Somewhere between dreamy and in awe. I think this is a VERY difficult expression to achieve. It's basically a matter of how far the eyelids and eyebrows are raised, I guess. A tad higher and it's caricatural or it expresses surprise or even fear. A tad lower and it looks sleepy. Even at that painting's size it's millimeter work. I wonder if it's possible to let a boy of that age pose for that expression. I doubt if they can fake it. One of the major things I learned from this blog (and some youtube interview video's) is the preparation and studies. I think this charcoal study clearly shows it. The lightbulb attracts way to much attention. The cat looks a bit naieve with that grin on it's face. The two magazine piles are a bit to dull. The corner of the staircase makes you wonder what's happening downstairs and thus detracts. And of course : the addition of the boy really makes this scene. I think the patch on the uniform is 8th Army. Could you say more about that? Thanks. The family and I will be up in Allentown this weekend for the exhibit...I can't wait! The pics you posted have wet my appetite even more! I remember seeing this one on your web site. It reminded me right away of my Grandmother's attic in Poughkeepsie. Right down to the army uniforms and school banners. The stack of Geographics was what I was up there looking for. This one has always been one of my favorite paintings of your James. My Dad has stacks of National Geographics in his attic. He has been a subscriber for as long as I can remember. My in-laws went to see the Allentown exhibit and were very impressed. I would have loved to come hear your talk, but I was out of town taking an art workshop that weekend. I hope to find time to at least get over to the exhibit before it wraps up. Your blog is wonderful! I learn a lot from your posts. Thank you for sharing your knowledge! Thanks, Stacy. Your absence from the talk is approved since you were at an art workshop. If you're in New York in April, I'll be giving a similar talk at the Society of Illustrators on April 9, and at the NY ComicCon on the 17. Hope to see you there! Christine, yes, that's an actual uniform, down to the last detail. I think it's from the Army Corps of Engineers, but my notes are in the glass case in the museum, so I can't check for sure. great image. rockwell would be proud! Lovely! I love the little Sunblom santa on the back of the Geographic in the forground. Very evocative. Heidi, very observant of you to notice the Sundblom! Beth, no need to be an artist to read this blog. There are readers with all kinds of other specialties, and I welcome all perspectives and comments. Jen, if you can drum up interest in a European museum for the National Geographic show, I'm sure that the curators at the Norman Rockwell museum would be happy to consider it. Erik, I meant to say how much I appreciate your perceptive comments about the earlier sketch. And you're right about the challenge of painting eyes! Nice to hear all your memories about attics and grandfathers. I grew up in suburban California, where no one had attics, and both my grandfathers died before I was born, so this painting is a bit of wish fulfillment for me. This is a really, really beautiful painting. It makes me recall a photo from an old anniversary issue of National Geopgraphic where an older gentleman is sitting in what looks like an attic roo that appears to be constructede out of old issues of NG. I remember seeing this cover as a kid! Wonderful work - it really captures that feeling of curling up with a stack of yellow magazines on rainy afternoon. I did a little research and the 8th was involved in the Pacific during WW2. They fought at Luzon and liberated Manila and the Phillipines. Maybe your character is reading about his own story. Thanks again for the painting. Phenomenal work, Jim. I love the ship clock and the college pennant. What a beautiful piece! I have visited on occasion and always enjoyed your blog greatly. After seeing this work all I can say is that I am just in awe! That's an excellent piece! And yes, I do admit I thought of Norman Rockwell. I think it's something to do with the quality of light, and the expression on the boy's face--i.e., the tone of the scene--rather than the style, though. This painting really brought me back. It almost exactly replicates my grandfathers house. The only major difference is that it was his den, and he was air force instead of army. Thanks for the great blog.